I had some errands to run today and made a quick stop to Wal-Mart this morning after dropping Zoey off at school. I am so happy that I did! 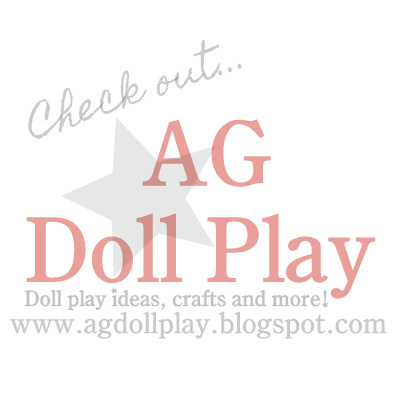 I happened upon some really fun doll finds, some of which I will share here in this post. These outfits were each $9.99 and included some fun little accessories. This outfit I thought would be so fun for a spring outfit...it's really adorable. The capri's are separate from the skirt so they can be used for other outfits. The tutu style ruffled skirt will be fun to use for ballet too! The headband is so cute and actually stays on the doll's head better than some of the American Girl brand ones! This outfit is super cute too...a bit more casual and comfortable looking and included a fabric, stretchy hair band (which is reversible), a bracelet, and a little shrug. Regarding the shrug, it's something we will have to be careful with because it's going to be really easy to pull I think...I had to be careful when dressing the doll to make sure I didn't snag one of the doll's fingers in one of the holes in the shrug. It's super cute though! And now on to the last outfit...the adorable and fun polka-dot swimsuit! We love this set! It came with sunglasses, flip-flops and even a cover-up! Too cute! Same as with the shrug, the cover-up will have to be something we are careful with because I could see that it would get snagged up pretty quickly by velcro. It is adorable though and absolutely essential when it comes to planning for spring break, don't you think? So there is our review for the clothing from this brand. As far as I know, this brand (My Life As...) is only available at Wal-Mart (online as well). We purchased one more set from this brand but I am waiting for Zoey to come home from school to surprise her with it so it's not opened yet and out of the package but when it is we will be sure to share our thoughts on that one as well! I would check off and on...I hadn't seen them at our store but then today there was just one of each set left! I must have lucked out or they were just being put out! I thought so too Tonya! Thanks for reading and commenting! I saw those outfits tonight when I went to Wal-Mart (except the bathing suit) and I was debating on whether to get them or not! I just might have to go back and get them because they look so cute on your doll!! and be on the look out for that bathing suit it's to cute!! Thanks for the review! You are welcome Kayla! Thanks for sharing as well! That bathing suit is adorable, I will have to keep my eyes open for that one! I just got the tennis outfit, very cute, but the fit is a bit tight. Their stuff is hit and miss, some is really nice and some not so great, especially in the shoes. Just wanted to let you know that I am new to your website it is so cute! These outfits are super cute!